Caring and thinking people across America are profoundly concerned this morning about U.S. Supreme Court Justice Anthony Kennedy’s announcement of his retirement yesterday — and for good reason. Kennedy has provided the crucial fifth vote on several basic matters of human rights and the notion that he will now be replaced by another Trump appointee like the abominable Neil Gorsuch, who might will sit on the court till mid-century, is certainly grounds for deep angst. “I want to establish these facts up front as I begin my obituary of Justice Anthony Kennedy’s judicial career, because what follows will not be especially charitable. Justice Kennedy was a Cadillac’s intellect in a Lamborghini’s job. His writing ranged from needlessly flowery to completely incoherent. And, while his views sometimes placed him to the left of men like Scalia and Bork, his ‘liberal’ opinions were frequently his most incomprehensible. 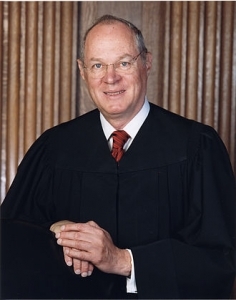 “When Kennedy cares about an issue, he can demand that the law remake itself overnight in his image. Just think about his vote to repeal the entire Affordable Care Act. Or his Citizens United opinion which, as the New Yorker’s Jeffrey Toobin reported, came about after Kennedy rejected Chief Justice Roberts’ incremental, more modest approach to the case. “And even when Kennedy did embrace marriage equality in Obergefell v. Hodges, he tiptoed right up to the line of holding that discrimination against gay, lesbian, and bisexual Americans is subject to ‘heightened scrutiny’ under the Constitution, without ever writing those magic words. At every stage of the journey from Romer to Obergefell, Kennedy used his decisions to dole out just a little bit?—?but never too much —more equality to sexual minorities…. “Nevertheless, for all of Kennedy’s shortcomings?—?his naive view of money in politics and his disregard for voting rights, his crusade against the Affordable Care Act, his expansive conservatism and his miserly liberalism?—?America will be much, much worse off with Kennedy off the Court.